With plenty of moving services, Meathead Movers is fully prepared to help you get safely into your new home. Our clean-cut student-athlete Madera movers are dedicated to fulfilling all your moving needs to your satisfaction. There are many reasons to consider moving to Madera, but the city’s culture might be the best one. If you are considering a move for a new job or to enjoy a relaxing life in this town, you’ll want to check out what our Madera movers have to offer. The population in Madera has grown dramatically since 2000, skyrocketing from 43,000 to 61,000. This is not so surprising given all the area has to offer. As a county seat, it is well equipped to serve a growing population in the San Joaquin Valley. Although the town started thanks to the California Lumber Company in 1867, it has evolved significantly. Now residents enjoy a thriving business center and a blossoming cultural scene. Many residents appreciate the historic water tower and the drive-in movie theater. The city is also a great starting point for adventures in Yosemite National Park, which has an entrance mere miles from town. While life in town can be relaxing, moving can be anything but easy. You can greatly reduce your moving stress by letting Meathead Movers take care of the heavy lifting for you. Meathead Movers was founded by two brothers who wanted to provide people with high quality moving services by hiring high energy and trustworthy employees. We are the only moving company in the state that has a 100% Satisfaction Guarantee. This confidence is not without merit. Meathead Movers hires only the most reliable student athletes, all of whom are committed to working hard and carefully. While other movers can be lazy and irresponsible, our Madera movers jog when they are not carrying boxes or furniture. This above and beyond approach ensures that every move is fast and efficient. If this sounds appealing, be sure to remember that Meathead Movers has a full range of moving services available to you. Our Madera movers can complete local, long-distance, and commercial moving jobs. To round out the experience, Meathead Movers also provides reliable packing, storage, on-site relocations, and our distinctive moving concierge service. Moving to Madera is a great choice. 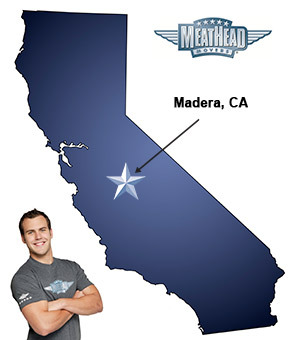 Make another great choice and hire the best Madera movers with Meathead! Call to get a free no-obligation quote today. Moving to Madera? Here are some helpful resources. Brandon and Jake were awesome. They worked so hard and had the best attitudes! They were polite and professional. We would have never made it without them; we’d still be loading!